Radicalism and Numbers Drained From March 4th Movement as Liberals, Dues Eaters, and Zombie Sects Fished for Recruits But All Out Against the Cutbacks and Again on March 2nd and Mayday! This submission to Substance is written by three people: Jack Gerson, Adam Renner, and Rich Gibson. We took on a collaborative project in order to present what may be, only in the most general sense, a common view that has significant individual perceptions. 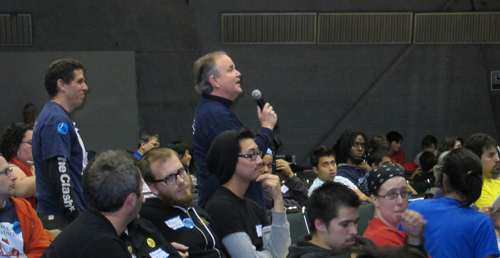 Our topic is the meeting that took place at San Francisco State University over the weekend of October 29/30th, 2010. Rich Gibson of Rouge Forum speaking to the meeting on October 29, 2010. Substance photo by Amber Goslee.The SFSU meeting was designed as a follow-up to the massive student outpourings (walkouts, demonstrations, free-way shutdowns, occupations, etc) on March 4th , 2010, opposing education cutbacks, racism, and war. The M4 actions, as many came to know them, rose up initially in California but were matched throughout the US, involving untold thousands of high school, community college, and university students–as well as some faculty at all levels. “On March 4th, 2010, masses of students, school workers, and community people organized under banners that said, “Educate! Agitate! Organize! Strike! Occupy! Teach-in!” Their actions, which included building seizures, express-way sit-downs, walk-outs, rallies, marches, and freedom schooling, varied from area to area but the connection of capitalism/war/racism/class war was made in every case I saw. The October 7th actions proved to be much smaller than March 4th for a variety of reasons: some schools were just starting; the cutbacks that were felt severely in March were not duplicated in the Fall semester and many students needed to be reminded, the election served as a predictable distraction for some, and the persistent work of the sects, liberals, and the unionites kept the movement off balance. On most campuses, actions on October 7th were about 1/4 the size of M4 and were, sensibly, less militant. 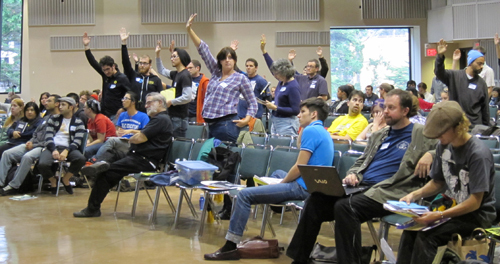 Some of the enthusiastic crowd that gathered for the planning meeting at San Francisco State University on October 29 and October 30. Substance photo by Amber Goslee.The October 29 meeting was designed, ostensibly, to pick up where M4 and October 7th left off–which would mean, taken radically, recognizing the retreat, yet seeking to rebuild the actions and class consciousness of March 4th . Interestingly, the majority of radical students who worked on M4 at San Francisco State opposed locating the October meeting at SFSU, feeling they would be sidelined by sects. That proved, at least in part, true. Arriving in the late morning, Saturday, I counted 157 people in the auditorium. Conference organizers claimed 217 arrived at one time or another. I have no reason to doubt that. However, by mid-after noon Saturday, about 2 p.m., the voting number dropped to 84. Why? I saw the conference agenda as completely inverted, upside down, which may be a key reason people just walked away and, like me, didn’t return on Sunday at all, choosing to meet with the friends who join in this writing. And there was never a discussion about what must be the beginning point of any resistance: Why are we about to do this? Who are our friends? Enemies? What is the terrain like? Not only was there no analysis of specific conditions, such a discussion was castigated in online chatter among people who planned to attend. The one pre-conference note I sent pointing to that as a problem was met by a challenge, friendly enough, from the list moderator. The meeting turned to action proposals, demands, and structure. Perhaps the organizers believed that a political discussion would be impossible with sects slugging it out over the correct interpretation of, well, whatever; hence the reversed planning. A standing majority passed a motion for a Day of Strikes and Action on March 2nd . But, toward what end? On to Demands and Structure. The absence of radical, to-the-root, analysis frequently meant that the lowest common denominator of agreement that could be quickly found, was found. For example, discussion about the false nature of “Public Education” , which is neither public nor educational but capitalist and counter-educational, was shut down. At base, this meant the people who United Teachers of L.A. activist Neil Chertcoff poetically calls “Dues Eaters,” or unionites, found an opening with liberals who want to Defend “Public Education” (but who want limited focus on, or no mention of imperialist war, following the same track the NEA representative assembly took in summer 2010, meaning they’ll take a bribe to abuse kids with high stakes exams, implement regimented curricula, and not complain about military recruiters in working class areas in exchange for pay), and sects who want to lead study groups but seem unconcerned about building a movement–these groups, plus some clearly confused aboveboard people–debased debate. That’s not to say the moderators were unfair. Other than one slim thug-in-his-own-mind-alone who threatened people with expulsion if they were even slightly out of order, moderators did a fair job mediating a difficult situation where people who reflexively reject Robert’s Rules, yet seek their own rules on the fly, sometimes trip over each other. But in this context with the agenda set up as it was, moderating was organizing a retreat from M4. Voting at the San Francisco planning meeting. Substance photo by Amber Goslee.While the conference did endorse demands like “No to war and incarceration,” in the same sentence they threw in “yes to public education.” The Dues Eaters will drive plenty of trucks through that and concentrate, most certainly, on a demand that found itself at the top of the list: “No to Privatization and Austerity,” when privatization is, at best, a second tier issue. What really is at hand is the corporate state, the government as an armed weapon and executive committee of the rich. There they work out their differences, then allow the rest of the population to choose which of them will oppress us best. Rather than “No to Privatization,” which leads people to misread schooling as public, when it is captured by the corporate state, and doubly misleads people into thinking they have something in common with this government and its schools, the line might have been the much sharper, “Rescue Education from the Ruling Classes.” That was not to be. A follow up demand insists that free “public” education is a “human right,” utopian pap ignoring the reality of segregated schooling on the one hand, and promoting the false commonality of all humans’ interest, as in Bill Gates and the entire teaching force–the lie the National Education Association and American Federation of Teachers tops rely on when they seek to use nationalism to promote school worker sacrifices. The interaction of opportunism, that is, aiming for prizes for one group (in this case, people connected to schools) at the expense of the class, and sectarianism came clear when one group proposed building working class conscious militancy in opposition to a one day action. If this feels odd; it was. On Sunday, October 31, when none of us returned, choosing to discuss what really might be done with the conference in apparent retreat, the skillfully graphic minutes show the remaining group set up a loose structure, a Continuations Committee to call more meetings and, presumably, organize, rather than network. Organizing, however, means a clear purpose — why are things as they are and what shall we do? Rumors from Sacramento suggest future budget cuts to schools in January. Should that happen, the radicalism of M4 may revive as its activists return to the memories of their strikes, occupations and demonstrations under banners opposing war and demanding the transformation of schooling as it is. Perhaps, more deeply, freedom schools will arise in the midst of this civil strife–better than capitalist schooling every time. What can we learn and do? We can see that when a more or less spontaneous movement which involves tens of thousands of people pops up, and it will again and again as people must resist to live, the sects, the Dues Eaters, the liberals, dogmatic pacifists, and others will arrive to feed on it. That’s part of the struggle. If taken properly humbly, perhaps we have things to learn from them–and maybe not. Inverting Grand Strategy, Strategy, and Tactics will never make sense. Nevertheless, this was a room full of honest young people seeking to find new ways of resistance and evidence from M4 says some of them have done it. It’s apparent that educational inequality, rooted in the bedrock of capital, will be a problem for any movement aimed at equality — important to recognize and transform with our own systems of education within the resistance–education as in leading out. There is a dramatic difference between an elite education at, say, Berkeley, and a community college education. Without belaboring the point, those of us who want to transcend inequity need to note that, change it as we go. There was, unfortunately, no discussion of upending the daily life of capitalist schooling–on the job from the bottom up, taking up, say, from the IWW tactic of the slow-down. Students whose lives are disrupted, indeed, impeded, by economic and social pressures that rachet down through university and school hierarchies can be organized to refuse to take the racist, anti-working class trick tests that propel so much of school now. Or, following the lead of some Michigan students not long ago, “Be a hero–Get a Zero!” thus showing exactly how smart they are and, simultaneously, how rebellious, in good humor. In those massive 300+ university classes, though, students can scorn scantron mis-education by openly taking the tests collectively (showing that all real knowledge is won socially) or tearing them up, or just refusing to fill them out. This kind of action can track from school to school, helping build a Day of Action in the future. We can build March 2nd which, with all its flaws, could redouble numbers and action. We can seek to link the schools’ based resistance to the immigrant rights movement which revived the international workers’ holiday, Mayday, four years ago, and rise again, perhaps with as many soldiers as we can find, on that day again. I want to highlight two issues that Rich noted in his careful analysis of this meeting before suggesting the necessity of revolution as a pedagogical process. One, I also noted that the organizers and the attendees at the meeting were largely well-meaning educators, students, social service providers, veterans, and other workers who were doing their best to organize resistance against austere budget cuts, particularly, and an irrational system, generally. Their success with the M4 protests and organizing earlier this year, indeed, bodes well for the upcoming actions. However, to highlight another point of Rich’s, the organizers were averse to any discussion that dealt with why things are as they are — online or at the meeting. While having large numbers of participants protesting the budget cuts, imperialist wars, racist incarceration, ICE raids, etc. is crucial, making sure participants understand the underlying causes of these issues is even more critical. Having the opportunity to interrogate it openly is fundamental. “Organizations are obstacles to organizing themselves. . . .There is no gap between what we are, what we do, and what we are becoming. Organizations—political or labor, fascist or anarchist—always begin by separating, practically, these aspects of their existence. It’s then easy for them to present idiotic formalism as the sole remedy of the separation. To organize is not to give structure to weakness. It is above all to form bonds. . . .The degree of organization is measured by the intensity of sharing — material and spiritual” (p. 15). How can we avoid becoming our own worst enemy? And, how can we become material and spiritual support for one another? As David Harvey concludes his latest text, The Enigma of Capital, he argues that we need some sort of animating vision for this ‘radical circumstance’ grounded in a ‘rigorous application of logic’ that helps create new mental conceptions of our world. These conceptions can only be constructed through action, examination and dialogue. Indeed, building working class conscious militancy is important, but not at the expense of ongoing action. What shall we base our reflection on? How will we experience the gravity of our animating theory? And, likewise, we cannot solely act. A day of action is necessary and symbolic. Days of action are imperative. But, these are empty without an understanding of why things as they are. And, that means, I think, that the revolutionary project has to have a pedagogical component. Perhaps, it is central to the entire endeavor. For me and my K-12 classroom, for instance, I have been searching for the intersection of liberation, curriculum, and student experience (comprised of individual traumas, structural oppression, nine years of mis-schooling, varying levels of confidence and skill, etc. ).How can I shape the revolutionary subjects necessary to help tip the inflexion point toward the necessary qualitative changes? When we teach math, social studies, language arts, and science, can we credibly do so in a way that is separate from the growing militarization of our schools and society, gang and drug infestations in our communities, rampant unemployment, a school to prisons pipeline, the assurance of our students’ ignorance through standardization and a teach-to-the-test mafia-like pressure on teachers? So, if we shouldn’t teach our classes that way, can we organize in such a way that militates against such explorations? The revolution requires such a pedagogical project that helps us teach and learn why things are as they are. Those who are interested should join us in advocating such a pedagogical position and becoming a harmonizing voice within the United 4 CA Public Education movement. Jack Gerson Continues the Conversation. I want to go back to Rich's critique of the October 30 conference. I need to say at the outset that I agreed with much of it — especially that the conference was inverted, and I think largely for the reasons Rich outlined. What I'm going to talk about are areas that I think need elaboration, and areas where I think I have a different view. (1) More elaboration is needed on why October 7 was so much smaller than March 4th. I think the main reasons are all related to the fact that last year's movement began with the huge eruption on September 24 — at UC Berkeley 10,000 students, staff, faculty and supporters filled Sproul Plaza to overflowing, marched through the campus, and then hours later sat down in the streets around the intersection of Telegraph and Bancrofit and rallied again. Where did this come from, on a campus that had been moribund for years? I think the answer is that UC administration and the UC Regents over-reached when they went after every segment of the campus community simultaneously: announcing a planned 32% tuition increase; laying off staff and threatening their benefits; restricting faculty's participation in UC governance by giving emergency powers to UC president Yudof, and also cutting back academic programs. As so often happens, the enemy and their blunders were our best organizers. They over-reached and got the response they deserved — a mass movement to fight them. Immediately following September 24, the UC organizers reached out beyond UC — to CSU, community colleges, K-12, and community — and built the October 24 Mobilizing Conference to Save Public Education, with 800 attending from 100 or more organizations. That conference called for the March 4 Strike and Day of Action, and set up an open continuations committee. Anyway: last year's success on March 4 stemmed from the perfect storm of September 24, and from the decision to spread the movement to other sectors and to call an October 24 conference to point the way forward. This year is very different. No September eruption. No October conference. The university hasn't been as openly grasping and confrontational as last year. Also: last year many folks with different views — including from rival left groups — were able to work together to build March 4. The movement was big enough for that to happen: people were smart enough to realize that we'd all do better by working together. But right around March 4 — and certainly in its immediate aftermath — several different groups who had worked together each went into "cadre building" mode. You know what that means. (2) Let's talk about public education. What's the problem? Well, we know that the deck is stacked against high poverty schools, families, communities — and especially against low income black and Latino families. The bases of the "achievement gap" are class conflict and racism. That's not going to be fixed under capitalism. The role of education will continue to be to teach kids how the world works — and to understand their place in it is to do as they're told or get shoved out — to the military, to the streets, to prison. But that doesn't mean that we should oppose calling for universal free public education that encourages curiosity, inquiry, conceptualization, understanding, and how to work cooperatively to make the world a better place. And it doesn't mean that we shouldn't actively oppose the cuts. In fact, it was the call for universal free education that was the impetus, the driving force, behind September 24 and October 24. Let's look at this another way. We surely won't get a decent life for all working and poor people under capitalism. But that doesn't mean that we don't fight for jobs with decent pay and good working conditions, for pensions, for health care, for social security, and for transforming society so that these and more are possible. I see the fight for public education the same way. Why did thousands of students surge into Sproul and into the street on September 24, 2009? Their education and their futures were threatened, and they saw the tuition increases as rolling back public education, and decided to do something about it. We have to support that fight, while pointing to the limitations (as you do). If we don't do this, I don't think they'll listen. (3) I'm too tired to take up privatization. Other than to say that I think the ruling class is serious about downsizing public education, and two of their big weapons in this are "choice" via charter schools and outsourcing to contractors. I agree that this isn't the main dynamic, but it's not trivial. Gibson tosses in the last words: Substance readers will see above what we see as an honest representation of the movement rising up in the k12 world and universities. As we wrote, the University of California system announced another set of fee hikes, 8%, and a Regents’ meeting to ratify the increases. At the same time, heads of the California State University system (the “workhorse” compared to the elite UC “race horse”) announced projected 15.5 percent fee hikes which would be 245 percent since 2001. Students and profs immediately began to mobilize for the Regents and Trustees meetings that will happen this week. At issue, still, is why things are as they are, and what to do. What I see is the emergence of the corporate state in an imperfect, not-seamless, fashion, but the corporate state nonetheless (for example the merger of government, finance capital, and industrial capital coupled with the real promise of perpetual war). The corporate state stands above, and uses, mass, popular, multi-tentacled fascist movements (tea-partyites, Minutemen, Klansmen, religious fanatics, imported fascists from US adventures in other countries, etc), none of them making sense in and of themselves, but taken together formed to protect and advance US capital. Even so, there are always lessons to be learned in active resistance. On to March 2nd and Mayday, 2011! Up the rebels !